This position paper gives invaluable perspective on what to be aware of as you finish your lifetime of ministry. The heart of this paper deals with four Consolidation Categories of things you should do if you want to finish well and leave behind a legacy. These include: 1.) Nine Ministry Activities often seen in Afterglow; 2.) Deliberate Modeling; 3.) Strengthening Lasting Achievements; 4.) Passing the Baton. 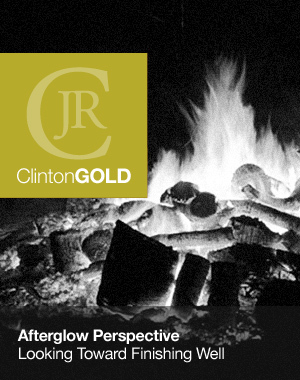 Afterglow, the major word in the title of this position paper, is a picture word—it takes us to a fire, which has burned down to a large set of glowing embers. Light and heat are still coming from this fire, which is in its finishing stages. May you glow brightly as you finish well!